By 1986 I was working as a typesetter slash proofreader slash copy editor, which helps to explain my other blog and my obsession with correctly written English. I was also working in a bookstore (see previous sentence): no surprise there. Nowadays, thanks to the ubiquity of computers, everyone is his or her own typesetter, spellchecking acts as a (sub-par) proofreader, and there are hardly any copy editors, since unpolished writing is considered a virtue. I also taught myself to knit, a hobby which, amazingly, stuck with me to the present day. (I've been on a serious glove kick for about a year now and have probably a dozen pairs: before that, it was eighteen months of hardly anything but socks, until I realized that I don't actually like wearing handmade socks, so I just started making them for my mother and stepfather: they have about sixteen pairs between them. Last year I made, on commission, a christening gown for a co-worker, and it was about three months' work; now I'm committed to making a christening blanket for another co-worker, plus a couple of pairs of gloves and a couple of chemo caps. Lucky for me I enjoy it.) In the summer of 1986, on a whim, which how I do a lot of things, I decided to teach myself, so I got a book from the library, bought a pair of cheap needles and some cheap yarn from a department store, and set to it. Not long afterwards, I bought an issue of Vogue Knitting, the Holiday 1986 issue, which contained a pattern by Kaffe Fassett, a vest utilizing about thirty colours of yarn, the likes of which I had never seen before. It seemed unattainably difficult, but I bought a copy of his first book and was soon collecting odd balls of yarn--no worry about colour-matching with his patterns--which I eventually used to make such things as a full-length coat for a friend using perhaps 150 colours of silk, wool, mohair, cotton, and alpaca. This was very eighties: exuberant complexity coupled to a sense of fun, two qualities that are evident in the perfumery of the time. And, of course, I smelled everything that I could get my hands on. Only a half dozen or so 1986 launches made any real impact on me: I was living in a proper city, Halifax, but I still didn't have any idea of what a niche scent was (no Comptoir Sud Pacifique for me yet, no L'Artisan Parfumeur, let alone Serge Lutens or anything nichier still), and the Internet didn't exist to make it possible to order rarities and oddities, so I was limited to what the department stores and the local boutique brought in, which is to say mostly big launches, "big" being the operative word, because, and I apologize for having to say this over and over again, scents in the 1980s tended to be enormous clouds of aromatics that threatened to choke everyone if overapplied, which they often were. The biggest launch of 1986 was Obsession for Men, the eagerly awaited follow-up to Calvin Klein's blockbuster the previous year. Nowadays, a men's version of a women's scent is commonplace--expected--and rarely has anything to do with its namesake, since it's just leveraging on the established name, but Klein got it right: Obsession for Men was and still is an intense oriental scent, warm and ambery, but where the women's is a thick vanilla-floral cloud, the men's is a barrage of spices, lots of smooth clove but also piercing nutmeg. It is colossally strong and overwhelming, an attack dog in a bottle. I couldn't wear it, but instead bought the soap, which is usually a good way to modulate an overly strong or otherwise unsuitable fragrance: you get a burst of it when you shower, and then most of it washes away, leaving only a trace on your skin. Nowadays it's all shower gels, and most scents have them in the line, but in the eighties it was always bar soaps, big cakes of them in their own lidded dishes; I must have had a dozen--KL, both Obsessions, Coco, Grey Flannel, Fendi.... It was an inexpensive way to enjoy a scent, particularly a scent I wouldn't otherwise wear, knowing how fleeting the soap would render it. Montana Parfum de Peau made a big splash in 1986: a radioactively massive leather animalic oriental chypre floral fruity thing which, despite the sound of it, was glorious, not just "everything up to and including the kitchen sink" but a sophisticated, complex scent which I still remember fondly. And that bottle! I went through at least two of Hermes' typically generous sample vials of Bel Ami, but I didn't get it, I wasn't ready for it: a bitter leather chypre as cruel as a whip-crack. The odd thing is that I was already wearing Krizia Uomo, which in retrospect must have had at least some similarities to Bel Ami, which I haven't smelled in about twenty years: but the Krizia worked perfectly for me and Bel Ami didn't, one of the endless mysteries of olfaction. Eventually I came to an understanding with it, but I never did buy it, and now--like everything else on Earth, certainly everything from that era--it's been reformulated, and whatever it is now, it isn't going to be what it used to be, certainly not a chypre, so it will have to live in my memory. 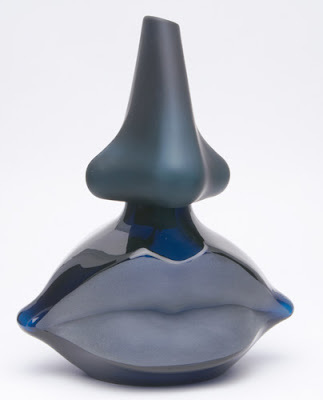 Liz Claiborne was a big bright cheery fruity-floral scent, an outsized charmer in a ridiculous bottle--a big clunky triangle of plastic, red or yellow or blue depending on the size (probably 30, 50, and 100 mL) with a triangular glass window to expose the juice. It was so cheerful and sunshiny that I actually bought a bottle of it, although I hardly ever wore it: not my style, but the kind of thing you like to smell from time to time to put yourself in a good mood. Sung by Alfred Sung was a compelling white floral, oversized as everything from the mid-eighties seemed to be, a statement perfume; a friend wore it discreetly, in tiny dabs, and it worked for her, but I would hate to smell it in any quantity. Teatro alla Scala was more to my taste: a potent, spicy oriental, rich and ambery, very much in the Cinnabar/Coco mode, now long gone. Parfum d'Hermes dates from 1984, but it was picked up by the local boutique in 1986, and it made an immediate and huge impression on me: I bought a quarter ounce of the extrait, which I seem to recall cost me a crazy amount of money, probably $75 or so, which nowadays is nothing but back them would have given me pause. And yet I had to have it: it spoke to me immediately and insistently in a way that brooks no refusal. 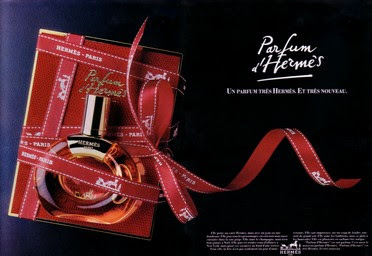 If I am not mistaken, Parfum d'Hermes was rethought and relaunched as Rouge Hermes in 2000, but was also re-introduced under its original name as an eau de parfum at some point. I have a sample of the more recent EDP which I've never even opened (it was part of a collection from The Perfumed Court); I'll compare and contrast one of these days. I doubt it can be anywhere near as good as the original, not least because even the original EDP was not nearly as magisterial as the parfum. But early this year I discovered that a private collector had a half-ounce bottle of vintage extrait (a lifetime supply for me), and of course I had to have it; at $135, it was probably the same price it cost (in 1986 dollars!) back when I bought my original bottle, and therefore a huge bargain. Though I hadn't smelled it in over twenty years, I remembered it so accurately and overwhelmingly that I had no choice but to buy it. And it was exactly as I had remembered it, and it was everything I had ever thought it was. I'm not quite sure what to make of this ad, because Parfum d'Hermes doesn't read as "fun" and it doesn't read as "young", either. The first thing you will think of if you get your hands on the vintage extrait is, "This smells expensive." Very expensive. Whatever you may or may not know about perfumes and their composition, there is no doubt that Parfum d'Hermes contains high-quality ingredients, artfully constructed, because it smells like an extremely classy rich person would smell. It opens on a little shiver of aldehydes, citrus, and stark green galbanum, barely masking the floral chypre oriental to come. Almost immediately afterwards, a big imposing column of incense which lasts the life of the scent looms into view, followed by a cluster of elegant flowers: definitely rose and jasmine, of course, but also ylang and other things that a better nose could probably identify, but which to me read as "subdued eighties floral", because the floral quality is subdued, forced into submission by the incense and the burgeoning chypre-oriental base: oakmoss, of course, and a hint of the dankness that myrrh often confers, a cloud of labdanum and oriental warmth, spiced vanilla and honeyed woods. It is sublime: complex as most everything from the era was, multi-layered and resonant, alternately sweet and bitter, warm and sharp. It is a perfectly reasonable answer to the insane question, "If you had to pick just one scent to wear for the rest of your life...?" Unlike the bottle for the original Bijan--another big eighties floral chypre oriental--the Hermes bottle isn't open in the middle, but is closed off with a pane of glass, possibly for manufacturing rather than design considerations, but maybe just to add weight, or to make the thing seem less like a bagel set into an earring. The box is also beautiful: a hinged coffret the colour of cinnabar, lined with satin as if it ought to hold a piece of jewellery, with an outer sleeve printed with the classic Hermes ribbons in red. The screw-off cap is amazingly heavy for its size, and the whole bottle is meant to abstractly suggest a riding stirrup, a natural choice for the Hermes horsey-set image. There's nothing horsey about Parfum d'Hermes, though: it is classic and elegant from start to finish. My experience of scent took off with something rapidly approaching the speed of light after my twin epiphanies of Obsession (a fragrance can possess you) and Poison (men can wear any scent they want to), so everything past this point is likely to be kind of a muddle. I tried everything new and old, I pestered the salespeople for bucketloads of samples, and I bought everything that appealed to me that I could afford. Estee Lauder Beautiful, a big pushy Sophia Grojsman floral which I never wore in public (it's really floral) but which was so attractively constructed that I just wanted to smell it. Fendi, a massive ultra-eighties floral oriental with a molassesy thickness and darkness. Creed Green Irish Tweed, a classic masculine fougere (and one of very few Creed scents I consider worthy of the house's reputation). Perry Ellis for Men and Perry Ellis for Women, two scents that everyone was wearing: I wore them both. The men's version, which I have a huge bottle of, was and is a smart and presentable leather chypre, Krizia Uomo in a casual suit and tie. The women's was a radiant aldehydic floral barely masking a cozy wood base, in the Vega/Wrappings/No. 5 mode but, like the men's, more polite, more reserved--a knowing smile rather than a huge gleaming grin. I also have a vintage bottle of the parfum, and though it's the colour and almost the consistency of apricot nectar (even though it's hardly ever been out of its box and the bottle is black glass, or really a dark bluish purple glass that looks black unless you hold it up to try to look through it), it smells spectacular: big juicy citrus and glowy aldehydes at the top, a tumult of indefinable flowers with a bare wisp of wood smoke curled around them (cedar sometimes has a wood-smoke component, I've noticed), a lustrous, not-too-dark woody base that can't decide if it's oriental-sweet or chypre-dry. The EDP is, as expected, a little brighter and sunnier than the extrait, but also smokier, while the extrait reads a little more definitely as a chypre: there's no telling what reformulations the thing might have gone through, or the damage that might have occurred to the parfum. But they're both gorgeous. 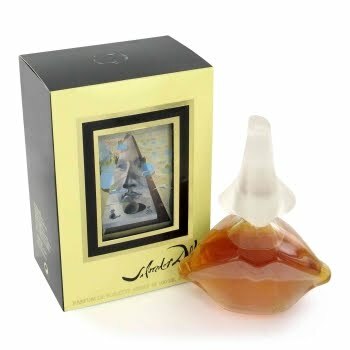 When I discovered Dali in Halifax, it was available as (among other things) a 30-mL EDP for $24. Not only did I buy it, I convinced a plurality of my friends, male and female, to buy it, too. It was (relatively) inexpensive, it smelled amazing and was packaged in an amazing bottle, and most of all, despite being at least in part a floral, it expertly bridged the gap between masculine and feminine scents. I think that more than any other scent, Dali was the smell of the eighties to me, and unless it has been drastically altered in the last three years since I bought some, if you were to smell it today, you would understand another crucial aspect of mid-eighties perfumery: the sheer scale of it, the complexity, and most of all the what-the-hell freedom.